Padhu Sankar shares some behind the scenes dope of the making of her blog, Padhu’s Kitchen. From where it all began – a journey of culinary love and beyond. Sankar is a Food Blogger who loves cooking healthy food, gardening, yoga, food photography, music and traveling. Her blog focusses on easy to make recipes with ingredients mostly available at home. 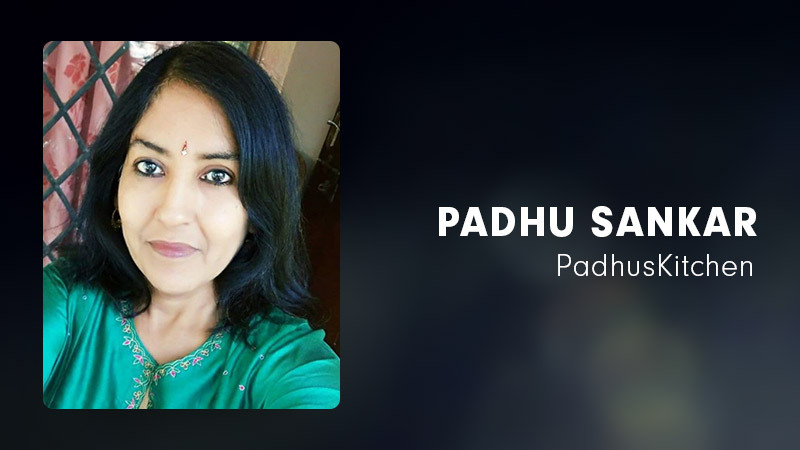 Padma, known as Padhu by her loved ones started her blog in a bid to share her passion for gastronomy. I always had a passion for cooking and love cooking healthy meals for the family. My passion for cooking and my desire to share my knowledge with others lead me to start a blog. Padhuskitchen.com was started in 2008. My name is Padma but everyone calls me Padhu. Since the dishes I blog are from my kitchen, I named it padhuskitchen. That’s it. I keep my recipes as simple as possible so that anyone can cook. Most of the ingredients I use in my cooking are easily available. I am a learner and keep learning new things and keep developing my skills on things related to my website. I travel a lot, try and learn from different cuisines. Most of the time my conversations are always about food. I learn from different people and experiment a lot in my kitchen. Cooking in a way helps to express my creative side. I also love learning about different cuisines while traveling and try to incorporate them into my cooking. It is through advertisements. I also do some product reviews but very particular about it. I don’t accept products that I don’t like to use and also don’t review anything unhealthy. I give my best and don’t worry about anything. Mails from all over the world telling me that they are big fans of Padhuskitchen. Things like, whenever they need a recipe, they first come to Padhuskitchen etc. Some newly married girls write to me that I am guiding them like their mother. It makes me very happy and also more responsible. I love gardening. I have a small kitchen garden where I spend my time. I love to be with nature. My day starts at 5 am in the morning. I go for a 5 km walk and do some light yoga. That is my time. Then I cook for my family. After 10 am, it is mostly my website work, cooking for blog, taking videos, editing etc. I work until 4-5 pm in the evening. Be yourself. Have your own style, Whatever you do, have your own personal stlye, never copy others work. Have patience and never give up. Persistence is the key. There is no short cut to success.